A representation o additive colour mixin. Projection o primary colour lichts on a screen shaws seicontar colours whaur twa owerlap; the combination o aw three o reid, green, an blue in equal intensities maks white. 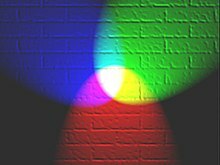 The RGB colour model is an additive colour model in which reid, green, an blue licht are addit thegither in various ways tae reproduce a broad array o colours. This page wis last eeditit on 12 Julie 2016, at 04:15.